The focus of my blog is to review book series and not individual novels, but writers are going to continue writing novels within a series even after I have done my review, so I plan on reviewing the individual novels as they come into circulation. 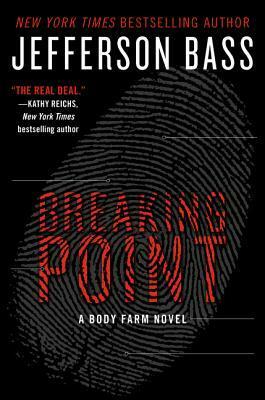 Jefferson Bass just recently added book #9, Breaking Point, to the Body Farm series. Jefferson Bass’ Body Farm Series is one of my favorite series, so I have really been looking forward to this latest release of Breaking Point. This novel is a prequel to the series and follows in the footsteps from the previously released novel, Cut to the Bone. It begins with Dr. William Brockton, founder of the Body Farm, investigating a plane crash south of San Diego involving a well-known humanitarian, Richard Janus. At first it seemed just a matter of recovering the body and determining the cause of the accident, but as the excavation continued it becomes apparent that something more sinister was taking place. After the excavation, it seemed that Brockton’s contribution to the investigation was complete but then information came about that his findings were wrong and his career and the body farm were on the line. Brockton’s luck turned from bad to worse as a series of events begin to take place that pushes Brockton to the edge of his own sanity. I have mixed feelings about Breaking Point. The first half of the novel focused totally on excavating the crash site which became rather tedious. Unless you really wanted to know all the intricate details in the slow progression of excavating a crime scene, then I think you will find it a bit boring. However, for the second half of the novel, the drama of the story escalates as Brockton must deal with both professional as well as personal hardships and at the same time try to solve a perplexing murder which does make for an exciting read. With the ending, it becomes apparent that the series has come full circle which may give a hint that the next in the series will take off from where The Inquisitor’s Key ended. For those of you that have not read the whole series in order, some aspects of this novel may be confusing. Cut to the Bone followed with Breaking Point are prequels, the rest of the series then takes off with Carved in Bone with the rest of the series ending with The Inquisitor’s Key. So with the exception of a slow start, Breaking Point won’t disappoint particularly if you are a fan of the series. To learn more about the series check out Jefferson Bass’ Body Farm Series. Posted in Forensic Thriller.Tagged Body Farm, Book Review, Book Review Blog, Book Series, books, Forensic Thriller, Jefferson Bass, Thriller, William Brockton.